Collaborate on completing and signing documents with team members using the Slack messenger. Track your team’s activity on shared documents with instant notifications in Slack. Keep up with document turnaround by accessing, filling out and signing documents from within Slack. Edit PDF documents online, turn them into interactive fillable forms by adding smart fillable fields such as drop-down menus, formulas, checkboxes and images as well as date and signature fields. 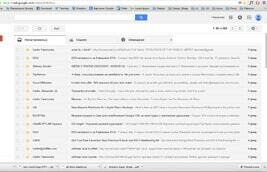 React to comments and track changes immediately while collaborating on documents. 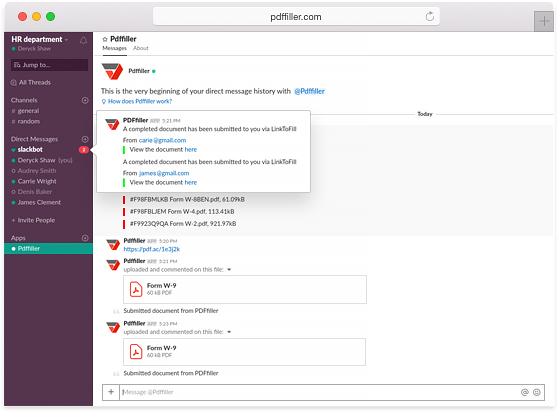 Receive your fillable forms filled out and signed directly in your Slack account. 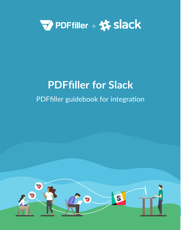 Instantly generate a link to a fillable PDF and automatically share it in your Slack channel. 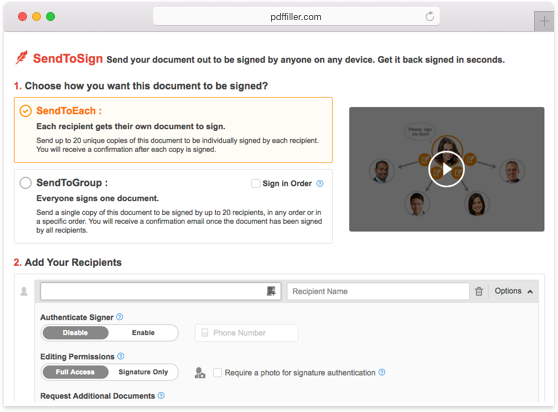 Get documents signed by your team members on any internet connected device in minutes. Once a document is signed, it will be uploaded to the same Slack channel as it was shared in.